The political disarray in France’s mainstream parties is encouraging debate about Frexit. The possibility is alarming economists, who fear it would cause a “cardiac arrest” in global finance and make life harder for the poor. EURACTIV France reports. France’s presidential candidates have not managed to focus their campaigns on international issues. The French Institute for International Relations even had to cancel a debate on the subject, which had been scheduled for 30 March. “Given the state of the campaign, none of the major candidates were able to attend,” the think tank’s president, Thierry de Montbrial, said, adding that a president typically spends around half their time working on foreign policy issues. While the presidential candidates talk little about foreign affairs in general, they often bring up the subject of Europe in order to criticise it. And if the left-wing, centrist and right-wing candidates all see France’s future inside the EU, the National Front and other extreme-right movements are all in favour of Frexit. Even radical left-wing veteran Jean-Luc Mélenchon sees leaving the EU as a Plan B. The main argument of the pro-Frexit campaigners is the reacquisition of sovereignty, which they believe has been undermined by the European construction. 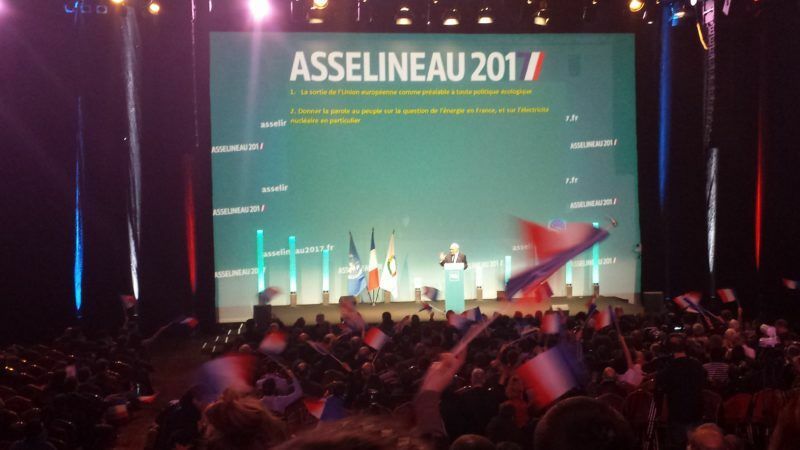 “The role of the president is to guarantee France’s independence,” said François Asselineau, a little-known candidate for the presidency. Often citing De Gaulle, he refers to himself as the real “Frexit candidate” and would also pull France out of NATO and the euro. For him, Mélenchon and Le Pen may talk about leaving the EU but they don’t really intend to do it. “Marine Le Pen would do it after a referendum and for Mélenchon it is only a Plan B, in case Plan A doesn’t work. If I am elected I would invite all the other heads of state to Paris and I would invoke Article 50 immediately,” Asselineau said. As a net contributor to the EU, France would have nothing to lose by leaving, he believes. This fringe candidate gathered the signatures of 569 local mayors from small communes to support his campaign, meaning he is officially on the ballot paper, but he is only expected to take around 1% of the vote on 23 April. In the National Front’s campaign, which is highly critical of Europe, the question of Frexit is something of a background issue. In a press conference on the currency earlier this month, Marine Le Pen made no mention of the possibility of a French exit from the EU but insisted instead on monetary independence. 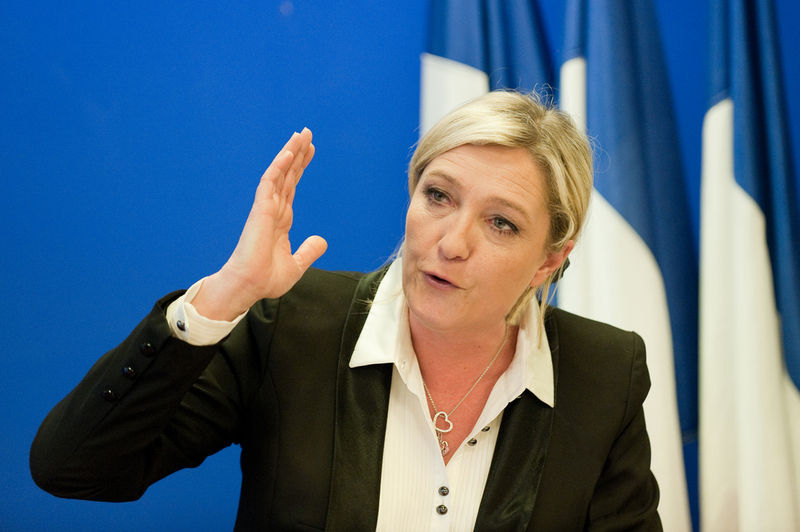 But even if she does not focus on Frexit herself, it is the National Front leader who gains the most from anti-EU themes, not only because she is the best-known of France’s anti-EU candidates, but also because of her strategy of permanent victimisation: Europe and the euro are always accused of being in the wrong, while France and the French citizens are the victims. Several candidates want to leave the euro, despite the fact that the population at large is in favour of the single currency and that there is little to suggest any economic benefit to doing so. For Asselineau, “the situation is serious. The quicker we get out, the mess we will suffer from the explosion of the euro.” He predicts a “catastrophe” if France remains in the eurozone. In January, ECB President Mario Draghi warned Italian MEPs that if the country wanted to leave the eurozone it would first have to “settle its debts” with the Central Bank. In Italy’s case, this would be particularly painful, as it has a negative balance of some €360 billion. Asselineau believes Italy would default on its debts, causing great harm to France, which in turn he believes would have no great trouble settling its own debts and leaving the currency union quickly to limit the damage. The National Front’s plan may be more gradual but the end result would be the same. Most economists, however, believe the real catastrophe would be if France were to leave the euro. Frexit: worse than the collapse of Lehman Brothers? “Frexit would lead to a freezing of financial flows and bring the global financial system to a cardiac arrest. The failure of Lehman Brothers could look like a small shock in comparison, and even that had major real economic implications,” Grégory Clayes, a researcher at Bruegel, wrote in an article entitled Debunking 5 myths about Frexit. The ECB has already shown, with Greece, that it will do whatever it can to keep the eurozone from breaking up. And remaining in the eurozone gives countries access to very low-interest rates, which reduces the cost of borrowing. On the other hand, leaving the economic and monetary union would cause interest rates to skyrocket. In France, where national debt stands at 100% of GDP, or close to €2.2 trillion, this would be a serious blow. In the event of default, France would no longer be able to borrow on the financial markets. Even the possibility of Frexit, if it is not properly organised, could push France to default: the increase in interest rates coupled with capital flight would tip some banks into insolvency before the state itself went bankrupt. And while many economists agree that the return of a devalued franc would benefit French exports, they also believe any gains would be more than cancelled out by inflation on imports. “A decision to leave the euro would do anything but serve the interests of the working classes, which the National Front has particularly targeted: it would even be extremely harmful,” the left-wing think tank Terra Nova wrote. It placed the cost of leaving the euro at between €1,500 and €1,800 per household per year. Low-earning households and retired people would find it hardest to absorb this shock, according to experts, while “the most knowledgeable and best-advised” would be able to shelter their wealth. So Frexit would have no great effect on the rich but could be extremely costly for the less well-off.